Falling prices and increased availability have made LED bulbs the choice of most experts and users when it comes to household lighting. CFLs (compact fluorescent lamps) are still available, but most say that despite their lower upfront cost, go for LED instead, and we agree. The Philips SlimStyle 10.5W (60W) Medium base (E26) A19 has a unique flattened shape that lowers both its weight and its cost. Reviewers say it gives off a warm, even light and holds up well after long use. It's offered in soft white or daylight versions, and in 40 watt equivalent (450 lumens), 60 watt equivalent (800 lumens), and 75 watt equivalent (1,100) brightness levels. 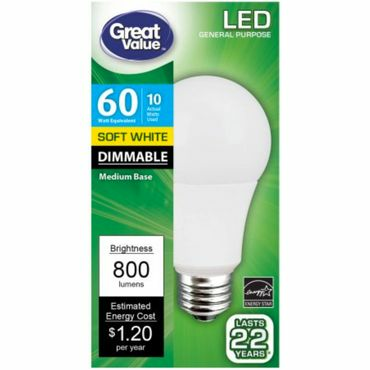 This Walmart Great Value LED Light Bulb is among the best values we've seen in an LED light bulb. It gives off a warm, even light that renders colors accurately, and it works with dimmers and enclosed fixtures. 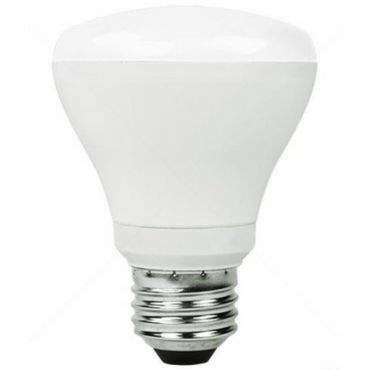 This soft white bulb is rated to last 25,000 hours, and produces 800 lumens of illumination (roughly the same as a 60 watt bulb) while using only 10 watts of energy. The Great Value LED Floodlight lives up to its name offering well-liked performance at a hard to beat price. 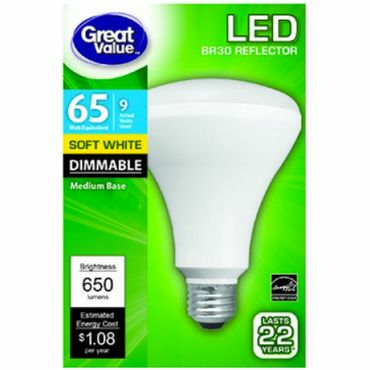 This Walmart exclusive sheds warm white light across a wide beam, and it works in nearly any type of fixture – including enclosed fixtures, outdoor lamps, and lights on dimmers. It's rated to output the same amount of light as a 65 watt incandescent floodlight (about 700 lumens) and to last for up to 22 years under normal use. Though LED light bulbs generally get better reviews, if low initial cost or other factors make CFL bulbs a better choice for you, the TCP 68914DLB10 CFL Mini Spring A Lamp appears to be very much worth considering. It's bright, long-lived, and inexpensive when bought in bulk. Energy efficiency is great, too, saving you as much as $500 in energy costs over its estimated 9.1 years of life. The start of 2014 brought a major change in the way most Americans use light bulbs. Incandescent light bulbs, the standard for more than a century, have all but disappeared from store shelves as a result of new efficiency requirements. The 2007 Energy Independence and Security Act required new light bulbs to become about 25 percent more efficient, with the changes gradually taking effect between 2012 and 2014. Since traditional incandescent bulbs couldn't meet the new standards, they faded from the scene over that two-year period, starting with the 100-watt bulb and ending with the 40-watt bulb. A few types of specialty incandescent bulbs -- such as appliance bulbs, three-way bulbs and bug lights -- remain available, but for the most part the Edison light bulb has gone the way of the dinosaur. 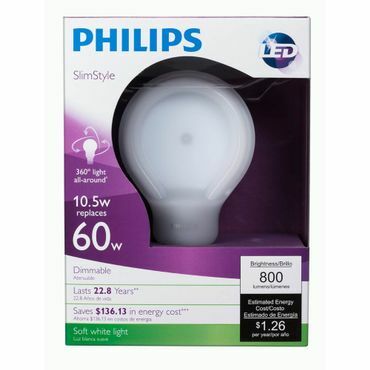 The most efficient light bulbs on the market use light-emitting diodes, or LEDs. LED bulbs use only slightly less energy than CFLs, but their lifespan is significantly longer. Most manufacturers claim their bulbs can run for 25,000 hours -- more than 22 years in a fixture that is used three hours a day -- and switching them off and on doesn't shorten their life. Most LEDs work with dimmer switches, although not with every dimmer on the market, and come on at full brightness right away. In fact, an LED is brightest when it's first switched on; over the next half hour or so, its light output gradually drops by 10 to 20 percent before leveling off. The brightness rating on the box, as measured in lumens, is the amount of light the bulb puts out after it reaches its steady state. For use in an overhead can fixture, experts recommend a floodlight or reflector bulb. These are identical to a standard LED bulb in every way but one: While standard bulbs ideally (see below) give off light equally in all directions, LED floodlights are specifically designed to direct all of their illumination in a single direction -- just like older, incandescent floodlights. Compact fluorescent lamps, or CFLs, have been around for decades, but people disliked their awkward shape, bluish flickering light, delayed startup and high price tag. New CFLs have resolved all of these problems. Costing as little as $2 per bulb, modern CFLs light up instantly, fit virtually anywhere an incandescent bulb can and have no discernible flicker. 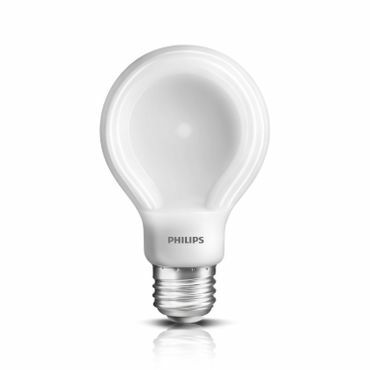 Soft white CFLs also match the light color of an incandescent extremely well. While both LED bulbs and CFLs have come a long way in recent years, there are still some issues to consider. Although modern CFLs come on right away, they take several seconds or even minutes to come up to full brightness, and most won't work with a dimmer switch. Although CFLs last longer than incandescent bulbs, switching them on and off frequently can greatly shorten their lifespan, so they're not ideal for fixtures that are used for only short periods. Also, CFLs contain a tiny amount of mercury, a hazardous substance. This means they have to be recycled, not just tossed in the trash, and you must take some minor precautions when cleaning up a broken bulb. 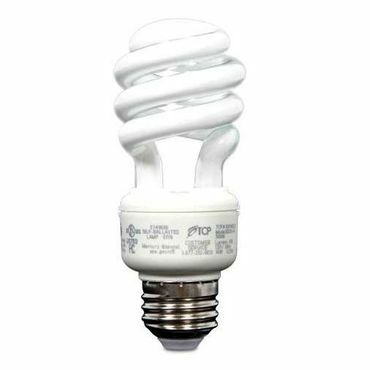 The U.S. Environmental Protection Agency has more details about disposing of CFLs. LED light bulbs have two main problems: they struggle to distribute light evenly in all directions, and they cost significantly more than other bulbs. However, both these problems have improved significantly in the last couple of years. We found many LED bulbs that earn top ratings for light distribution in professional tests, and prices, which were hovering between $10 and $20 just two years ago, are now generally less than $10 each. That's still more than most CFLs, but given the long lifespan and reduced energy use of LEDs, they're clearly the best value over the long run. New halogen incandescents are another lighting choice, and are the most similar to the old-fashioned bulb in both shape and light quality. However, feedback (expert and user) generally says to give them a pass. They're essentially just incandescent bulbs with a bit of halogen gas trapped inside, which helps "recycle" the tungsten gas that burns off the filament. These bulbs are efficient enough to meet the new standards, but only just. They also cost significantly more than an old incandescent bulb without lasting significantly longer. We spotted insufficient expert or user feedback to offer a recommendation to any halogen bulb for this update. Because new light bulbs produce more light than an incandescent with fewer watts, wattage has become an outdated gauge of brightness. All new bulb packaging includes a "Lighting Facts" panel that displays the actual brightness of the bulb in lumens, a measure of light output. The panel also includes facts about wattage, color temperature, mercury content and the bulb's estimated yearly energy costs. All this makes it easier to compare different types of bulbs directly, rather than trying to relate them to outdated incandescent bulbs. "The Best LED Light Bulb"
"Best LED Light Bulbs of 2016"
To select our Best Reviewed light bulbs, we looked at professional comparison tests from sources such as ConsumerReports.org and TheSweethome.com, which measure the light output, durability and efficiency of different bulbs. Then we checked their recommendations against user reviews at retail sites such as HomeDepot.com and Amazon.com, which provide useful information about real-world performance. Based on these and other sources, we identified LED and CFL bulbs that stand out for their light production, lifespan, energy use and price.